It’s the routine days that sneak up and grab you. This was going to be a regular Monday morning; we stop first to visit Nancy – who is not under hospice care, but we stopped in to see her a year and a half ago on the way to see one of our scheduled clients, Since then, we have been starting our Mondays the same way ever since. She is 92 years old and going strong. Nancy has the ability to fill up a heart. Off to visit Dorothy, who is one of our scheduled hospice clients and resides in a building next door. Rarely do we visit her in her room; she is always in the middle of her workout routine when we arrive – she moves her wheelchair along with her feet up and down the hallway five times in the morning, and again in the afternoon. We caught her doing the same today. Only this time, she motioned for us to come to her instead of the regular routine of waiting for her to come to us – so as not to interrupt her exercise. When we got to where she was, we noticed that there was a lot of luggage and assorted bags outside one of the rooms. Dorothy explained to us that the resident in that room did not have long to live; the bags were from all of the family members who had traveled to be at her bedside for her final hours. 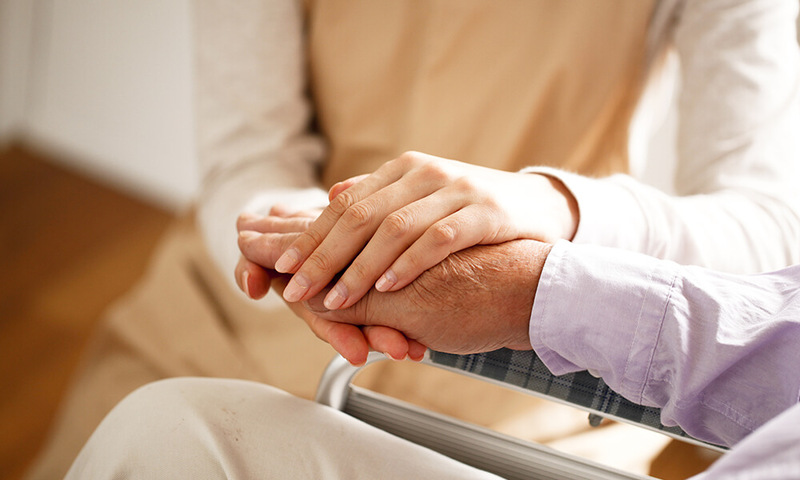 I see this kind of caring all the time – hospice patients taking care of other hospice patients. The compassion never ceases to amaze me. I agreed it was the perfect place to sit and visit. As happens frequently, word travels very quickly that there is a dog in the building. And sure enough, Emily came out to see Buckley. She was five. Dorothy took the lead. “Do you like dogs?” she said as Emily nodded. “This is Buckley. You can give him hugs and squeezes.” I chuckled as Dorothy suddenly somehow became Buckley’s master. I sat back and watched the magic happen. “Are you here visiting?” Dorothy asked. Again, Emily nodded as she stood face-to-face with Buckley, petting him. Dorothy knew Emily was here visiting her grandmother, and she also knew that seeing her grandmother unconscious was scary for Emily. We all just pet Buckley, until Emily spoke. “My gramma is in that room,” she paused, “we are all waiting for her to . . . “. Emily then pointed upward. She then began to cry, and she naturally hugged Buckley as her head turned sideways on his neck and shoulders. When a kid cries, adults cry. We all sat there for at least another twenty minutes – until Emily was ready to go back into the room. I walked slowly beside Dorothy as she moved her wheelchair back to her room. “You are a real sweetheart, Dorothy. You are just nothing but pure love,” I said. She looked at me, took my hand and squeezed, but she didn’t speak. Facing her own mortality with a realism that can only be felt by others of the same, I wondered if she was thinking with an increased awareness of her own very limited time. But I know Dorothy – she was only thinking of that little girl.